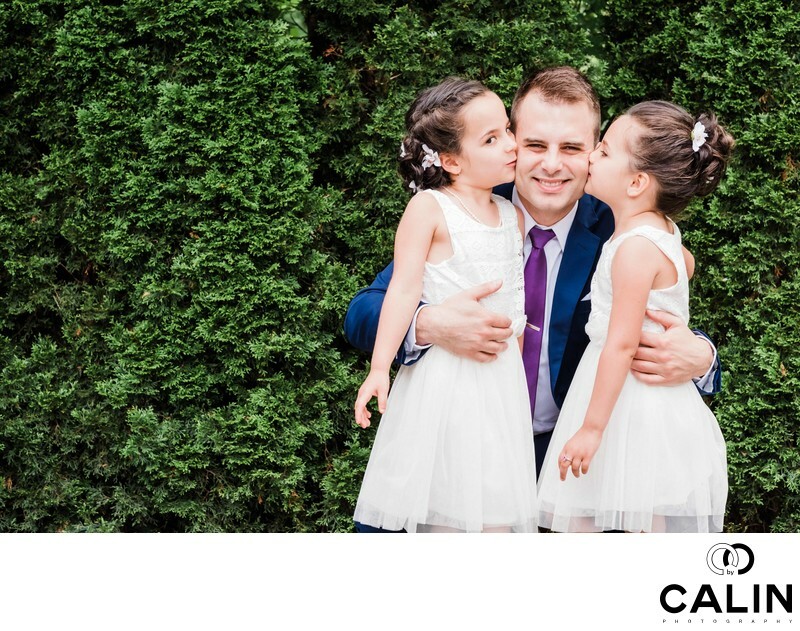 This beautiful photograph of the little flower girls kissing the groom before he left for his outdoor ceremony at Kortright Centre in Woodbridge is one of my favourites of the event. In this picture, taken during the beginning of the wedding day at the conservation centre, we see the three subjects of the photograph placed in front of an evergreen wall. Despite the fact this image looks candid, I had to prompt the girls to kiss the groom. While we were taking family photos before tying the knot, the two girls were standing on my right. I asked them if they could go and kiss their uncle. They were happy to oblige and I managed to capture that beautiful moment. While most emotional photograph is invaluable for the groom's family, from photographic standpoint is not an award winning one. 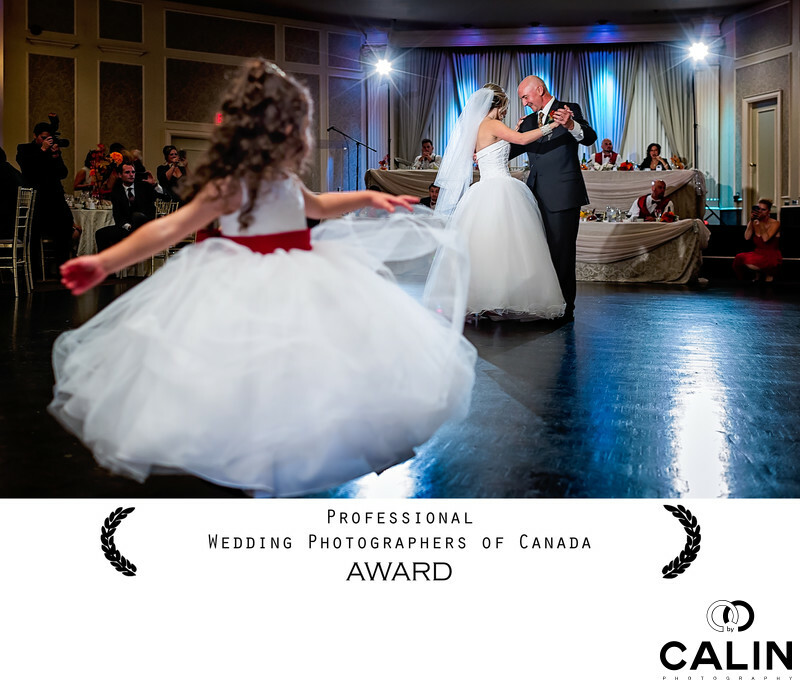 Widely considered the best photographers in Toronto, we always try to create visual masterpieces and our work reflects that. However, sometimes the bride and groom care more about real moments then about dramatic lighting, perfect composition and splendid sun sets. Yes I know, wedding blogs are all crazy about those. Speaking of composition, emotion beats perfection and this photograph impresses through its unique display of emotions, not through world-class composition. The subject is indeed off-center, positioned according to the Golden spiral, but I wish to is a second-story, another layer that will add dimension and depth to this photograph. In my opinion, the best wedding photographers are those who manage to include two or even three stories in one frame like we did in the award winning photograph below. The maid of honour, which is the mother of the two girls and the mother of the groom personally thanked me for this beautiful photograph. Sometimes wedding photography means simply capturing the moments that unfold in front of you. Some other photos I love from this special event are those where the newlyweds laughed and cried together during their wedding. Many clients believe that a wedding photographer job is done once the reception is over. That might be the case if you operate a photo booth but art is quite different. There are long hours of editing so that the bride looks perfect. For this particular photograph, I applied a colour correction, then cropped is a bit so I emphasize the subjects and lasts, I applied skin softening and selected vignetting.